We were so thrilled with the birth of this little filly. Moniet is definitely the best of her sire and dam. She is absolutely show quality! Extremely typey, beautiful top line, legs, long neck, big expressive eyes and a very pretty face. She has been evaluated by Peter Cameron who has been an International Arabian Judge for over 50 yrs and one of the things said was that she is one of the best fillies he has seen in years! We are very excited to be able to offer her to another show-breeding establishment. 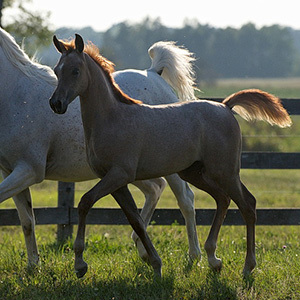 Moniet is nominated for the 2014 Egyptian Arabian Event Futurity Class.